W]hen once caught in the maelstrom of stock speculation the average man becomes more or less mesmerized, and at critical moments his conservatism, his resolutions and his theories all take flight. Under the discomposing influence of a rapid succession of changing values and alternating impulses he loses his perspective, is incapable of calm reasoning, and is likely to do precisely the opposite of what he had intended to do. 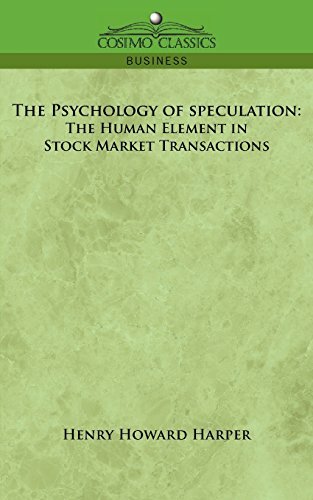 -from The Psychology of Speculation How do you keep your head when large sums of money are at stake? What are the greatest psychology stumbling blocks to successful trading? How can we beat the market by learning more about ourselves? This sensible little guide teaches us how to be aware of our own assumptions and prejudices while trading so that we will expect them when they begin to interfere with our reasoning, and so that we can counter them before we do ourselves a financial injury. Originally published in a private edition, Harper's Wall Street wisdom is again available to show us how to be enlightened speculators. If you have any questions about this product by Cosimo Classics, contact us by completing and submitting the form below. If you are looking for a specif part number, please include it with your message.